zo kan je nuttig en mooi verenigen. I have seen those. I have an old piece of steel that my grandfather used 50 years ago. The things you save that reminds you of someone. I'll bet there's plenty of boot-scraping to be done around your place! He is a bit stoic. Perhaps because he is tired of all those muddy boots. I think I would be. I agree, he is a fine addition to your porch. Thanks for linking up. with all those boys, I'm thinking your little friend is gonna pay for himself in no time. My mother-in-law has had this exact boot scraper outside her back door for as long as I can remember. She had four sons--it got a workout. You've really gone to the dogs. Or, dog. He's really sweet. And you've already handled him with care. He's really cute! And I bet he will get a workout. :-) When something calls your name like that, it's usually worth the investment, I think. He is so cute! I am glad you bought him. Those things are handy. My grandparents used to have one. By the way a long time ago you posted about wanting to know how to download PDFs. I finally figured it out!!! I don't know if you did. Here's what a it looks like: http://theapels.blogspot.com/2014/05/raw-organic-yacon-root-syrup-review.html (recipe download). sign in with FB account. Put in the title and description. Then there is an (Embed) option. It gives you the code to copy and paste into blogger, or Wordpress. Poor little guy. He looks like he's resigned to allowing people to scrape their boots on his back - but he doesn't have to like it. lol CUTE. I just love him!!! He is adorable, and I think that I would have bought him too. Where did you get him, I may go take a look. Or is it just a local place? I like your cute iron item. a black iron bed headboard. of prayers to grant your wishes. may come true in the end. By the way, How is Francie doing? I like it! I would have bought it too. What a neat boot scraper! I did not know they made such unique boot scrapers. Now,I want to see if I can find one for my husband. It is adorable...no wonder you brought it home. Ha! That is quite different and I'm sure he's been scraping for a long, long time! He's cute. Glad he's now yours. Oh, I think this is wonderful, Lisa! Oh your boys will remember growing up with him. We finally changed out the carpet for concrete floors in another effort to keep the floors clean. 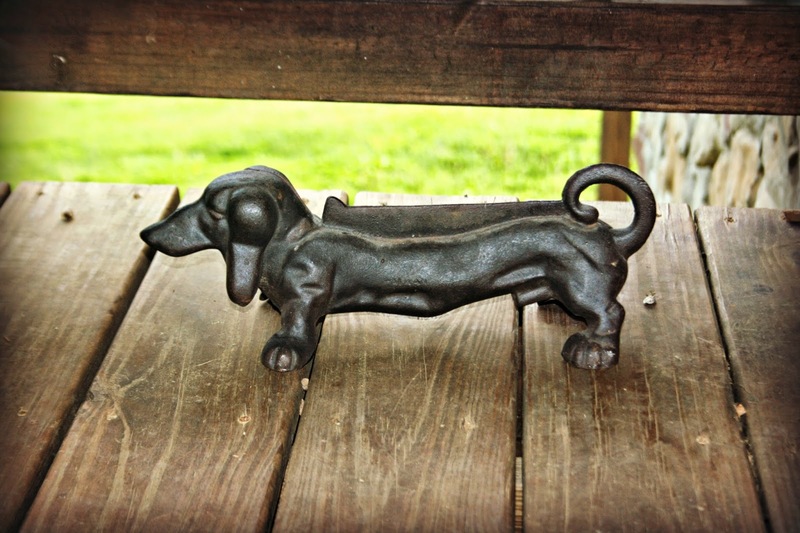 Your wrought iron doggy just makes me smile. I think you made a good choice. He's a cutie. I love wrought iron things, too. They are hard to come by these days. This is cute & practical. I like that. A great find! ...and you'll enjoy having him around whether or not he helps with 'boot scraping'. He is adorable. Subtle yet adds a nice addition. Nice choice. Nice find--I like him too. We enjoy browsing for unique items like that. Fortunately, we do more browsing than buying as we have limited space. It looks very cute! i had a real dog like this. It is of Dashion type! In college, I owned an iron bed that was very cool. You'll run across one at one of the better antique places. I enjoyed rummaging through an antique shop in Ohio during my visit home. I collect coffee mugs and treated myself to some vintage cups from "The Sands" in Las Vegas. He is a delightful little fella! I would have bought it, too! I have a Dachshund too, for real. But also one in porcelain, from my mother-in-law.